All over the news the past two days is that Roger Clemens has signed to play for the Houston Astros for $22 million for the rest of the season. 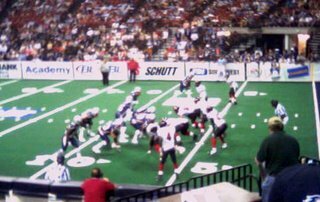 But today I was looking at the web site for the Round Rock Express, the Astros' Triple-A minor league team, and saw where Clemens will play in the Express' June 16th game. Maybe I need to figure out a way to get out of the June wine tasting for Women of Wine and the Men Who Adore Them, which is the same night Clemens pitches for the Express. This evening we went to try a brew pub -- the Draught House. Although it's been in business for more than 15 years, this is our first visit. They have been brewing their own beer for almost 10 years. 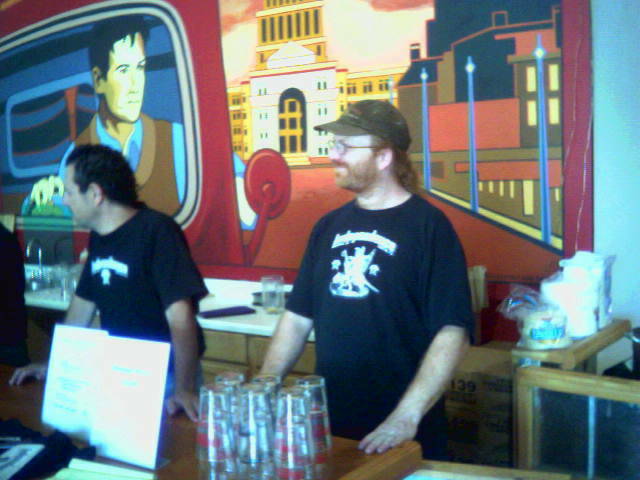 They have 65 other beers on tap, including Austin-brewed Real Ale and Live Oak. The interior is reminiscent of an English pub, while outside they have biergarten. Given the temperate weather, there were more folks outside than in. Of course, given that Tuesday is $2.75 pints, there were several folks enjoying themselves. We played this weekend very low-key. Main reason was that Doug was sick -- allergies or something. After two weeks of pushing hard and getting little sleep, he gets a three-day weekend to recharge, and instead he's coughing and hacking all over the place. Needless to say, he was a little ticked because of that. 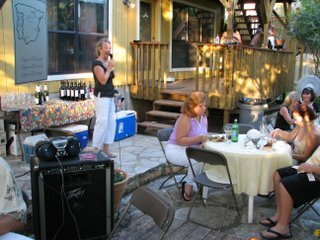 We did attend a gathering at the house of one of my friends. It seems like during the summer she has a few folks over every other weekend to hang out and swim in her pool. Often it's girls only and we have a wonderful gabfest. This weekend, however, it was mixed company. We had talked about making fruit wine this weekend, but found out that blueberries were not yet in season. Blackberries, our other berry of choice, was, but we decided we'd wait a week or two when we could pick both. Doug did organize his beer recipes this weekend. In another week, it will be two years since he started brewing. In that time he's made 57 different beers, and that's not even counting the beers he's made more than once. He's ready to start taking his brewing to the next level. Not much on store for this week. My friend Ann sent me this article and photo. I know it's very horrific, but it needs to be shared. 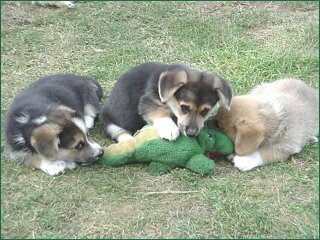 The alligator, one of the oldest and ultimate predators, normally considered the "apex predator" in its natural ecosystem, can still fall victim to implemented 'team work' strategy, made possible due to the tight knit social structure and "survival of the fittest pack mentality," bred into the canines over the last several hundreds of years by natural selection. See below for the remarkable photograph courtesy of Nature magazine. Not for the squeamish! Be sure you can handle the raw blood and guts nature of this photo before scrolling down! I guess it's the same all over. Nothing much is happening this week. Back when I was working in PR, you always noticed a significant slow down starting the end of May. People are heading out of town for graduations and weddings. 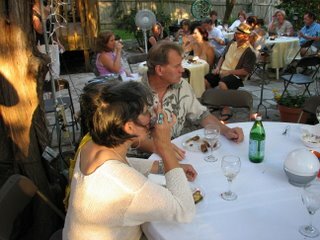 We only had about 30 people, versus our usual 45-50, at our May WOW tasting. 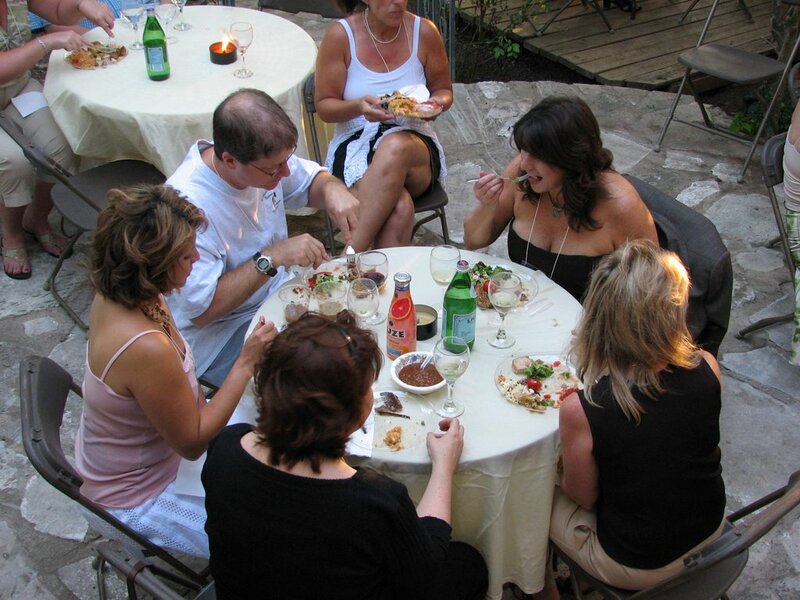 The Gonzo Gourmet Club had to cancel its dinner this month due to lack of responses. In all fairness, though, there hadn't been a Gonzo dinner in more than 6 months and we only had a 5 day notice -- of course, everyone was booked. 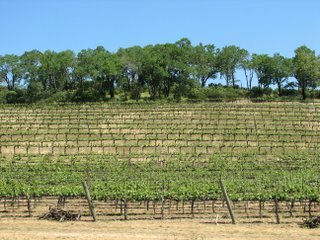 Anyway, I haven't been ignoring the blog, I just haven't had much to write about since our return from wine country. I did get news today that one of my friends/former colleagues is running for Congress in the First District of Arizona. His name is David Schlosser and he's a great guy. If you know anyone there, tell them to vote for Schlosser. The only other news I have is that my friend Tierney may have to put down her 10 year old black lab, Buddy. They are running tests for lymphoma. Three weeks ago when I was over there he was his same old self, but this last weekend he was really out of it. Tierney had taken him to the vet for a lump in his neck, and was told it was an infection. They gave him antibiotics, but he only got worse and didn't want to eat. By the time I left Sunday, he was having trouble walking. As of yesterday, it appears he went blind. Tierney had to try to close off access to the pool so he won't accidentally fall in. It makes me really sad to hear this, especially how sudden it seems. I don't know what we would do if we had to face that decision. Dexter is 10 1/2 and I know that it's only a matter of time (then again, the cat I grew up with lived to be at least 18). But I think that for us, it would be easier decision with a cat than the dogs. Either way, I had to give my animals a great big hug today. 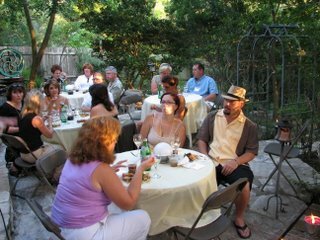 Last night was the May tasting for the Women of Wine and the Men Who Adore Them. We had a great time, as usual. We sampled Spanish wine and Ian Clark was our guest speaker. I think my favorite was the Descendientes Palacios Petalos Bierzos, while Doug preferred the Raventos Cava, which is a sparkling wine. The food was yummy. I'm a little disappointed because I made this thing where I rolled grapes in a bleu cheese mixture and then in toasted walnuts. It took me almost 4 hours for 150 grapes and only half were eaten. I think part of the issue is that it was outside with the wine (as they should be) instead of upstairs with the food, and people didn't see them. Oh well. A few of us are getting together for a swim and they will get eaten then. According to this quiz, it's Dublin. Take the quiz yourself and post where you belong in my comments. We made it home safely late night. We are both so tired from our trip; unfortunately for Doug, his bosses are in town this week for the big monthly meeting. At least the meeting is in Austin this month -- I'm not sure how he would make it if he had to fly to Rhode Island. Yesterday morning we were able to spend a few hours exploring San Francisco -- which is not nearly enough time. We checked out of the hotel (which was at Van Ness & Lombard) about 8:30 and walked the five blocks down to the day. 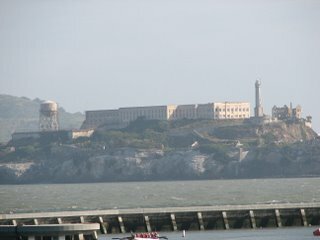 We could see Alcatraz, and saw several people swimming in the bay -- I'm sure it had to be cold. 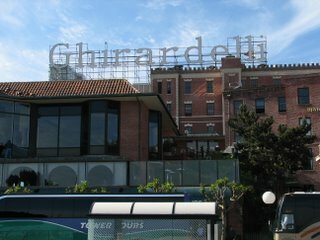 Next we walked to Ghirardelli Square. It was still too early for the shops to be open, but we were able to read about the history of Ghirardelli and San Francisco. We continued walking along the bay to Fisherman's Wharf. Walking along the open stalls of Fishermen's Grotto, the smell of fish was overwhelming that I had to go across the street to the Boudin Sourdough Bakery just to clear the air . They had a big window where you could watch the bakers make all sorts of sourdough creations. 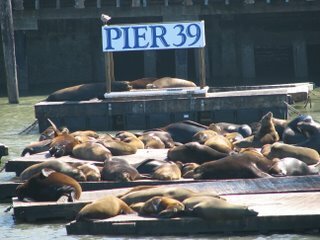 We walked all the way to Pier 39, where a colony of sea lions live. It was neat watching them. We had planned on catching a bus to Chinatown and having lunch down there, but in talking to someone, we decided not to do that. We would have only had time for lunch and wouldn't have gotten to walk around. 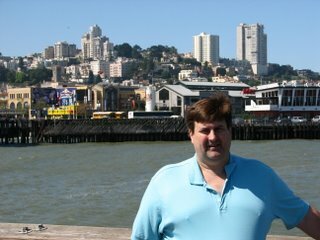 Instead, we walked back down Fisherman's Wharf to Pier 47 and had lunch at Scoma's, which has been around since 1965. After that, we walked back to the hotel and headed to San Jose to catch our flight (the San Jose is only 35 minutes from the San Francisco airport; we could catch a direct flight to San Jose, but not to San Francisco, redeeming our American Airlines miles). Overall, we liked the vibe of San Francisco. There were open-air stalls and artists selling their works. As long as we were walking, we got around okay, but driving into and out of the city was nerve-wrecking. We would have liked to see more of the city, but there just was not enough time. Maybe next time. 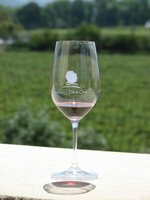 Like the previous two days we hit it hard and didn't get to see as many wineries as we would have likes. 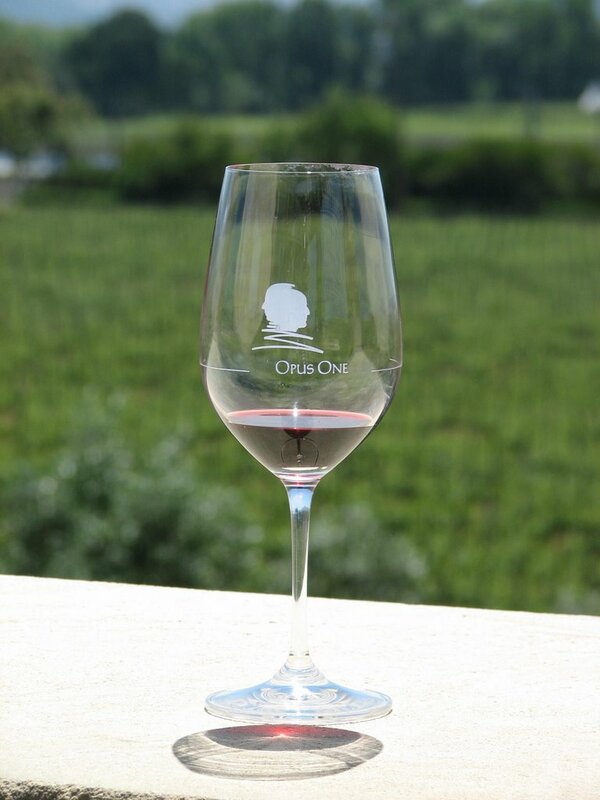 However, of the four wineries we hit, at three -- Opus One, Stag's Leap Cellars and Hess Collection -- we tasted wine that retails at more than $100. 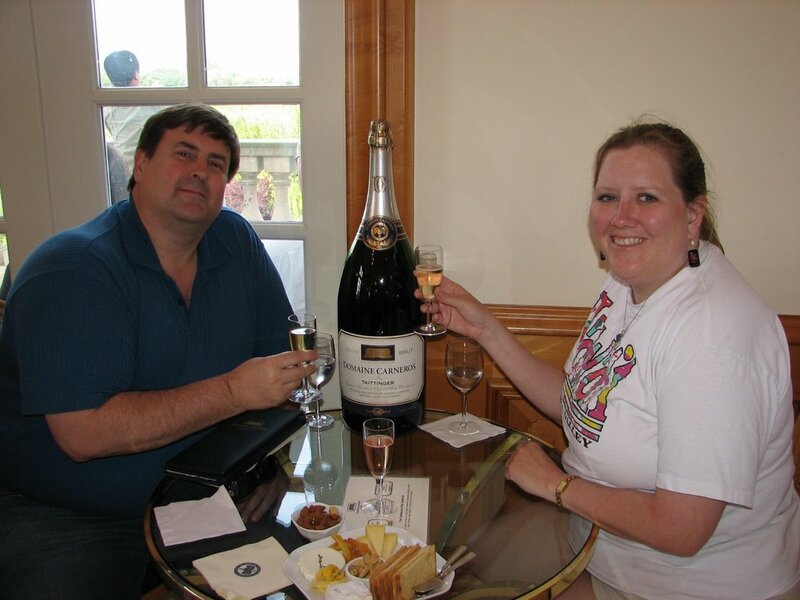 We tasted the most expensive wine we ever had. 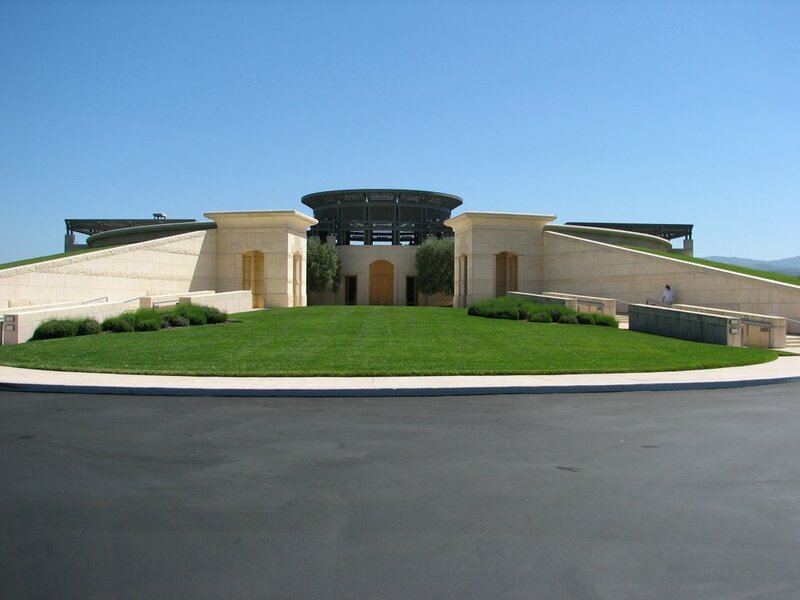 The fourth winery, Domaine Carneros, specializes in sparkling wine; the winery is actually owned by Taittenger. Various photos are included. After our last tasting we headed to San Francisco, arriving about 6 p.m. We stopped to take photos of the Golden Gate Bridge and then headed for the North Beach area, which is known for its Italian food. 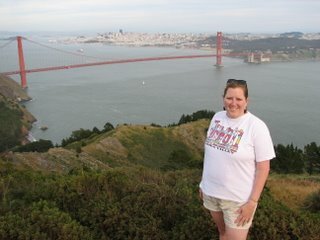 We will get to see just a little bit of San Francisco tomorrow before we head out. Our flight is 5:20, but it's in San Jose. Luckily, it's a direct flight; we couldn't get a direct flight in/out of San Francisco. We'll get into Austin about 10:30. Unless there is free wireless at the airport, I won't post tomorrow. Just a quick update -- we are very tired. 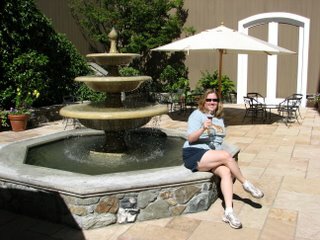 We visited four wineries today, primarily in the Calistoga, Ste. 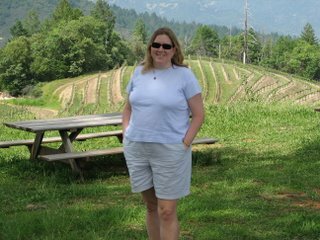 Helena, and Yountville areas of Napa. 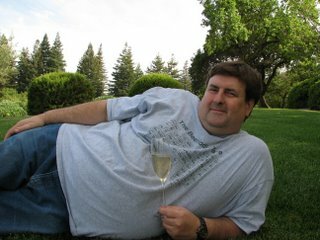 Our two favorites were Pride Vineyards (the photo of me), which makes a great merlot and cab, and Domaine Chandon, which specializes in sparkling wines (the photo of Doug). 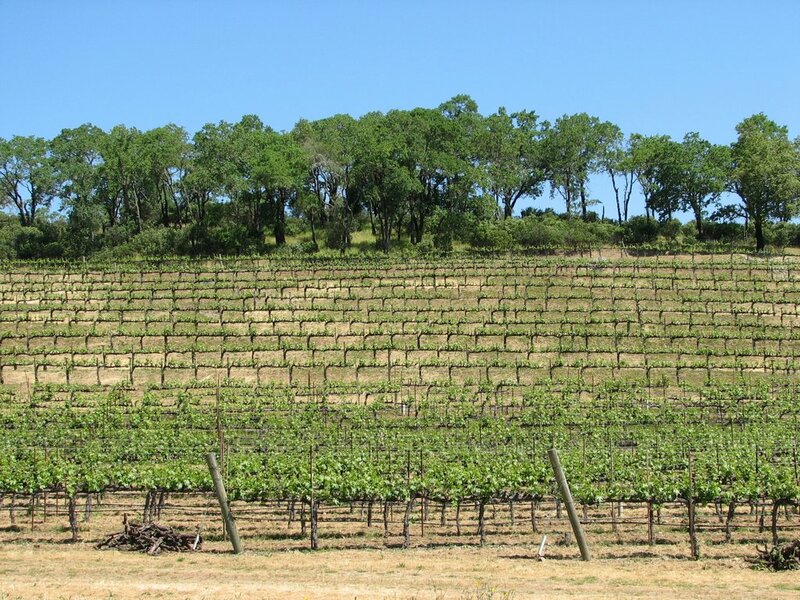 One thing about the wineries here, they look fabulous. In Texas, they are just tasting rooms. Here there are gardens, koi ponds and one place, a gondola to get to the tasting room. No wonder they charge for tastings! Tomorrow we are heading to wineries in the Sonoma area. I will try to post more. 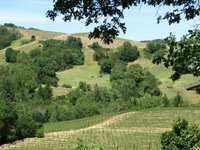 This evening we are heading to the California wine country. Doug and I will spend a few days there and a couple of days in San Francisco. We are looking forward to it. What I want to know, however, is why is it that no matter how far ahead you plan, there is always a rush of last minute activity? Speaking of which, I need to go pack. Our hotel is supposed to have wi-fi, so I will try to blog, time permitting, while we are there. Everyone needs to do their part to keep Austin weird. Today we were at the Pecan Street Festival, which is held on 6th Street. In fact, there is no Pecan Street in Austin, although there is one in Pflugerville. Actually, the naming of the streets in Austin seems to help keep Austin weird, but I digress. 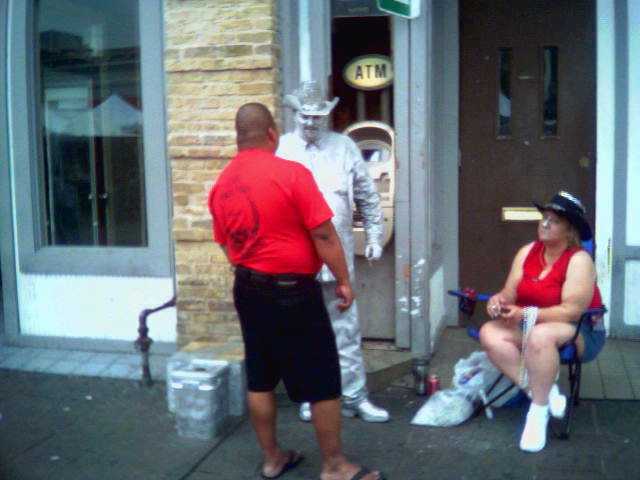 We were hanging out at the Pecan Street Festival and saw this metallic man. Not sure what he was doing dressed in silver from head to toe, but in Austin you really don't need a reason to do something off-beat. Off-beat is normal in Austin, while normal is strange. Still, he didn't seem to be pushing an agenda, selling a product or promoting a concert. He just was there, no more. Maybe that's the reason we like the festival so much, you can see so many unusual things. Today we toured Independence Brewing Company, one of the few independent beer brewers in the state. This guy started as a homebrewer and then started brewing professionally at the (now defunct) Coppertank Brewpub. A few years ago he started his own brewery. Currently Independence is available only around Austin. Normally they aren't open to the public, but on the first Saturday of each month they have a brewery tour. Actually it's more of an open house. People show up and receive three drink tickets, which happens to coincide with the number of beers they brew. We tried the Independence Pale Ale, but we thought it was a bit too hoppy for our tastes. 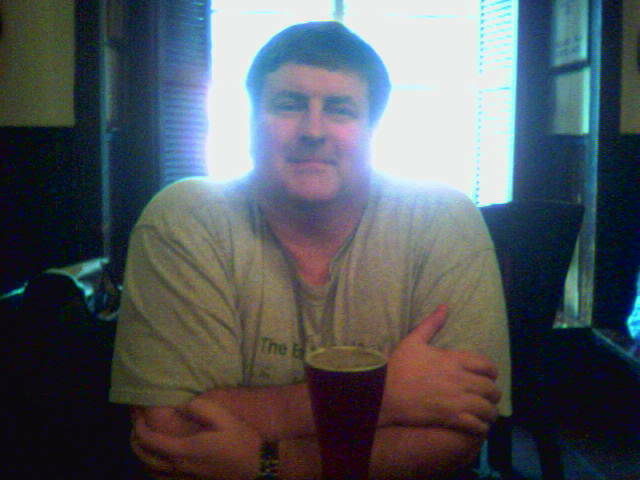 The Bootlegger Brown Ale was a bit too malty for me, but Doug liked it. I settled on the Freestyle Wheat Beer, which I thought was pretty good despite the fact that I normally don't like wheat beer. The brewery was basically a big loading dock. They opened the dock doors to let everyone in, and had a half-dozen wooden picnic tables. They also had a bar area. The back half of the dock was where the brewing equipment was. It was interesting. Also hanging around the brewery was Jasper, the brew dog. He made sure to check that everyone was having a good time. I gave my last final today. Whew! School is out. Grades have been turned in. Since I'll be coming back as faculty I had to pack up my desk in the graduate assistant office and turn in my key. After two years I'm leaving my office. It seems like a long time since I've spent almost two years in the same job. Such is life in tech PR. When I got home I saw I had an email from a student who offered to wash my car for a 0.3 bump in her grade. What she didn't see is that I round up my grades. I keep thinking I should have had her clean the car. :-) Unfortunately most of my begging students are ones who are so far away from a passing grade that no amount of rounding will help. I have decided not to teach advertising this summer. They found a PhD to teach it and this PhD is actually going to be teaching in the fall. This will allow me to focus on my thesis without having to worry about prepping for a class I won't teach again. Also, I don't have to worry about the gas and mileage for driving to San Marcos 5 days a week. Once I finish the thesis, I can prep for my other classes and pick up freelance work. In the meantime, I'm going to enjoy my summer break. Having the summer off is the best part of being in school. Back in February I asked everyone to send best thoughts and prayers to my friend Gary. His son-in-law Blake was in a horrible skiing accident. There is good news this week. First of all, Misty, Gary's oldest daughter, gave birth to a beautiful baby girl, Taylor Lynn. Mom and baby are doing fine. Dad is doing well too, as he is finally coming home from the hospital on Thursday. 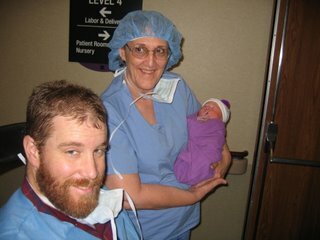 Here is a photo of dad, baby and grandma. In the fall I join the ranks of academia -- I have accepted a one-year contract to be full-time faculty at Texas State University. I will be teaching two classes of PR campaigns, one class of PR writing, and one section of Intro to PR (the class I've been teaching the last two semesters). It was actually a somewhat difficult decision to make. I had planned that I would go back to work and then be an adjunct, teaching one or two classes a semester. However, one of the PR professors got a sudden urge to retire and gave notice two weeks ago. In academia, it tends to take a year to fill a tenure-track faculty position. Since they can't fill the position with a tenure-track (e.g. a PhD) candidate by fall, they offered the position to me. I can see myself being a professor in 15-20 years, but I wasn't planning on making it my career yet. For one thing, it pays half of what I could make doing PR. That's a huge difference. But I haven't been seeing a lot of open positions at my level. I'm thinking a year of teaching would look good on my resume and will allow the market to come back. Plus, I'm getting to teach a couple of classes I haven't taught, and that's interesting to me. I may even be able to do freelance writing and PR work to make a little more money. The big thing is that I have to get my thesis writing this summer so I can graduate. The research is done, I just have to focus on the writing. I plan to do it during the first summer session, as I will be teaching advertising the second summer session. Until then, there are finals to give and grades to turn in. My last final is tomorrow at 8 a.m. All week I've been getting students begging for better grades, wondering how they can turn their F into a B. I hate to tell them that the best way to turn a F into a B is by intercepting the mail before their parents and using a really good ballpoint pen on their report card. 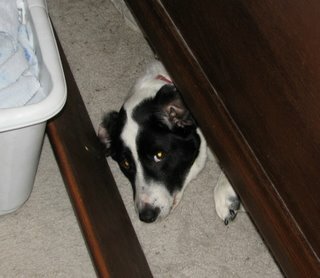 One thing to know about Dante, my 5 year old black lab/border collie mix -- he squats to pee. It's the funniest thing to see a male dog squat, but he does. Not as much as his sister, but he never lifts his leg when he has to urinate. When he was younger, we really thought this was strange, but our trainer assured us that there was nothing wrong, so we didn't worry about. One day two years ago we were walking the dogs and suddenly Dante lifted his leg and urinated on a mailbox. We were so excited that he finally grew up and at age three learned to pee properly. Then we noticed that he only did it when we were out walking. If he was in the backyard he still squatted. We realized that he only leg lifted if he was marking his territory -- he was still a squatter when it came to peeing. Luckily he kept his marking to a minimum and it wasn't too annoying. Until recently. Saturday we went to buy fresh strawberries at the farmer's market and took the dogs with us. On our way home we stopped at Bark 'n Purr to pick up food for the dogs. Doug had Dante and I had Allegra and we looked at buffalo bones, all sorts of goodies, and other dogs. Doug and Dante were walking down the aisle with the collars when suddenly Dante lifted his leg and started peeing all over the leather collars. I was mortified! He hasn't urinated indoors since he was a pup. Dante just decided this was the time to start showing his manliness. Doug got napkins and cleaned up the mess, but got out of there as quickly as possible. No treats, no goodies, just pay for the food and leave. We were both embarrassed. We just figured this was a one-time thing, after all, he had never done that before. And the collars were leather. Dante has a thing for leather, given the number of Doug's wallets he's destroyed. We weren't worried that there would be a repeat performance. The next day Doug was running errands and took the dogs with them. One of the stops was Petco, to buy a storage container for their food. Doug has both dogs by the leash, walking down the dog food aisle, when suddenly he feels a tug. He looks back and there's Dante, hiking his leg and urinating on a bag of Iams. Doug starts pulling on the collar, dragging Dante, who is in mid-stream and peeing all over the floor. Doug is ready to find a large rock and crawl under it. Instead he quickly makes his way to the register, checks out, and hopes no one is the wiser. Maybe the employees will blame the puddle on the cocker spaniel. So now our sissy-boy squatter is finding the need to mark his territory all over town, much to our chagrin. Needless to say, it will be awhile before Dante goes back to a pet store. Today is Doug's birthday. Evidently it's also the birthday of two of my students, but I'm not taking them out . I'm taking Doug to Eddie V's for dinner. He loves seafood and since I don't eat it, this is the one day a year he gets to go out and eat seafood. I think he's looking forward to it, but he's been sort of blase about his birthday this year. Be sure to leave him some birthday well-wishes.